Wow, really beautiful! I love the splash of color on white and the moon is a great addition to the composition. All around, great capture! Excellent shot, any idea on the length of exposure? Thanks, Jeff. I am not sure anymore, but likely it was either 30 seconds (the max normal time of the EOS3) or a few minutes as I also was carrying my remote control. The colors in this picture are pure magic ! LOVE this shot! The lighting is superb. Colors are stunning. And the composition is perfect…well done! 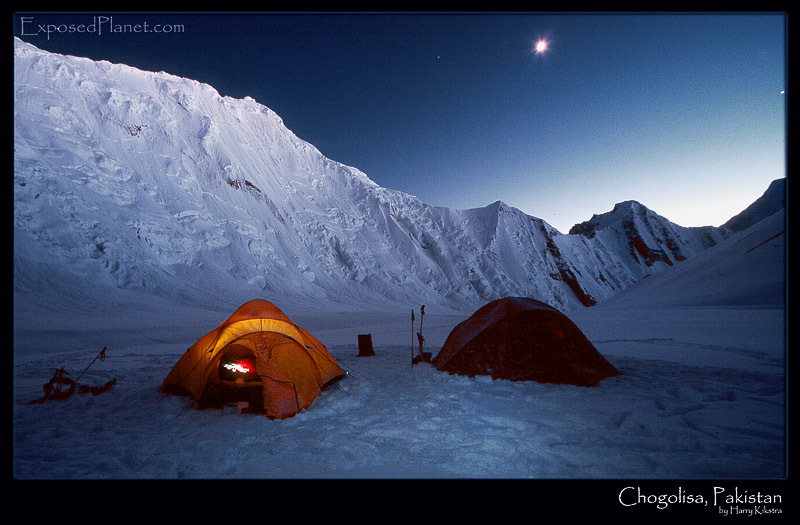 The story behind "Chogolisa Basecamp, Pakistan"
Chogolisa is known as Bride Peak and it is here that famous climber Hermann Buhl died. I went on a non-commercial expedition with 8 South African members and us 2 dutch climbers. After all the crowds on the -beautiful- hike in on the enormous Baltoro glacier, it was nice to separate us from the main track in search of a way up Chogolisa, more than 7500m high.